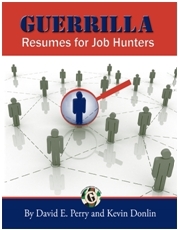 Guerrilla Job Hunting - A trojanhorse strategy for job hunters. A trojanhorse strategy for job hunters. Everyone's face lights up when they see one of those little envelopes that are peculiar to "thank you" note cards - those tiny little 4 x 4 white envelopes with barely enough room to write a name and address on the front and a return address on the back. Fold your resume and cover letter together carefully until they fit inside and then mail. Use this technique around any holiday - Christmas, New Year's, Fourth of July, etc. Use a small size tasteful stamp. To really get noticed, use a stamp with their logo on it and send them the rest.